Utahn Sri Daya Mata joined guru's fold and became "Mother of Compassion." Sri Daya Mata, president of Self-Realization Fellowship in Los Angeles, died Tuesday at 96. Courtesy of Self-Realization Fellowship, Los Angeles. Sri Daya Mata with Paramahansa Yogananda, SRF Hermitage in Encinitas, Calif., 1939. Courtesy of Self-Realization Fellowship, Los Angeles. Faye Wright was an unassuming Mormon teen in Salt Lake City until Paramahansa Yogananda, an Indian mystic, came to town in 1931, preaching a combination of yoga meditation, Hindu principles and Christian ethics. Dazzled by what she saw as divine love, Wright, the descendant of handcart pioneers and granddaughter of an architect of Salt Lake City's Mormon Tabernacle, gave up everything familiar to follow him to Los Angeles, where he changed her name to Sri Daya Mata. 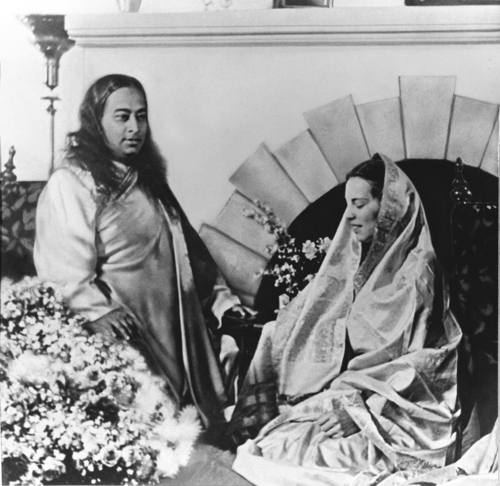 Three years after Yogananda's death in 1952, Daya Mata succeeded him as president of Self-Realization Fellowship, an unusually important post for a woman at the time and one she held for the next 5½ decades. Daya Mata died Tuesday of natural causes in Southern California at one of the fellowship's monasteries for females. She was nearly 97 and lucid to the end, Lauren Landress, the group's spokeswoman, said Friday. Daya Mata had spent the past few years meditating and "communing with God." Daya Mata means "Mother of Compassion" in Sanskrit, Landress said, and that was an apt description of the leader herself. "She really was an exemplary disciple in giving love to all," the spokeswoman said. "She saw every individual as a spark of the divine and devoted her life to God." Daya Mata also helped the fellowship expand across the globe, with 600 temples or centers attracting tens of thousands of devotees in more than 175 countries. Yogananda's teachings still are distributed to millions in a three-year home-study course. Nana Penrose, a Utahn and a member since 1973 of the state's tiny Self-Realization community (typically about 15 attend weekly gatherings in Salt Lake City), saw Daya Mata in action on several occasions. "I remember her as having a childlike quality, full of total joy," Penrose said in a phone interview from St. George. "She was wise and full of love." Though devotees worldwide hold Daya Mata in highest esteem, she spoke only of Yogananda and his teachings, Penrose said, never herself. After all, he was the visionary one. Yogananda came to the United States initially as India's delegate to the International Congress of Religious Liberals in Boston. Throngs of Americans packed auditoriums and concert halls to hear the charismatic Indian discuss how meditation techniques could harness physical energy. Yogananda promised them that personal experience with God was possible, that human beings can evolve toward God through individual effort and that complete harmony exists between Christianity and yoga. When Yogananda stopped in Utah, he met the 17-year-old Wright who had, she said, a "deep longing to know God." "I had a deep hunger for something more satisfying," Daya Mata told The Salt Lake Tribune in 1995. "I wanted something more than just going to church." With her mother and sister, the young Mormon joined about 4,000 people at a ballroom in the old Hotel Newhouse, which once stood on the corner of 400 South and Main Street in Salt Lake City. "As I stood at the back of the crowded auditorium, I became transfixed, unaware of anything around me except the speaker and his words," she later wrote in her preface to Yogananda's collected talks and essays. "My whole being was absorbed in the wisdom and divine love that were pouring into my soul and flooding my heart and mind." At the time she met the guru, the young Utahn was suffering from a severe blood disorder. Her swollen face was covered with bandages. When Yogananda invited audience members to approach him for healing, she was the last in line. He asked if she believed God could heal her. When she said yes, he touched her between the eyebrows and said: "From this day forward you are healed. In one week the bandages will no longer be necessary; your scars will be gone." It happened as he predicted, she wrote, and she pledged to become the yogi's disciple. Daya Mata took vows of obedience, loyalty, chastity and living a simple life of daily meditation, vegetarian meals and constant service to others. "I was happier than I had ever been," she told The Tribune. "It gave me such a sense of well-being to seek God in meditation." It is "only in the stillness when one can withdraw from all active life and meditate deeply that we begin to feel a deep awareness and communion with God." Soon after joining, Daya Mata became the guru's assistant, recording his speeches in shorthand. She helped compile the instructions on yoga meditation techniques into lessons that were distributed to eager students and members. As the years passed, Daya Mata assumed greater administrative responsibilities for the movement. In the 1940s, she took charge of the headquarters in Mount Washington, Calif., while Yogananda retired into seclusion to write the story of his life, Autobiography of a Yogi. He died in 1952. Three years later, Daya Mata became the fellowship's president. 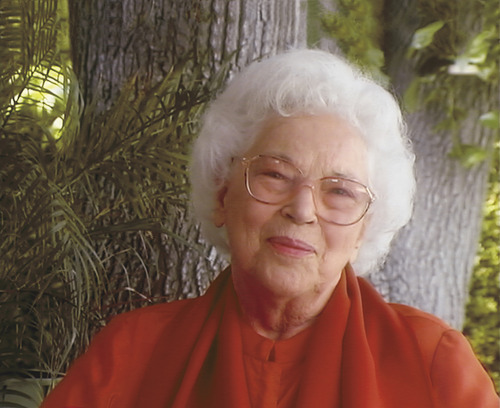 Wright held on to some of her Mormon beliefs, especially the notion that humans are gods in embryo, even while following Yogananda's teachings and practices. She had a good life, Daya Mata said in 1995. "It is not for everyone, but it certainly was what my soul was seeking." A memorial service for Sri Daya Mata will take place on Dec. 12 at 4 p.m. at the Pasadena Civic Auditorium in Southern California. For more information, please visit the Self-Realization Fellowship website at http://www.yogananda-srf.org.